Natural burial is for people looking for a more environmentally-friendly method of burial, rather than a grave with a traditional headstone. It provides an alternative form of burial in which the accumulating graves will remain forever. The areas have been planned to recreate an eco-friendly environment and provide important environmental benefits for the encouragement and protection of wildlife. Natural burial is available to everyone, irrespective of faith or religion. There is no need to follow traditional funeral patterns or religious ceremonies. Grave spaces are recorded on maps, so they can be found in the woodland. Following an interment, sufficient time must be permitted to allow for the settlement of the ground. At the appropriate time of year the grave will be grassed over. Woodland Valley is our new natural burial area on the edge of the city, on land overlooking the sea and downs in Woodingdean. 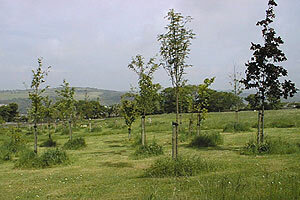 The original woodland burial ground was developed in the Borough Cemetery, Bear Road, Brighton during 1994 and became the first of its kind to provide a totally ecological funeral. Due to a large demand for this form of burial, the Bear Road site is now full with no new spaces available. There is also a woodland burial site in Hove Cemetery, on the northern side of Old Shoreham Road, Hove and easily accessible from the A270. Due to a large demand for this form of burial, this site is now also full with no new spaces available.